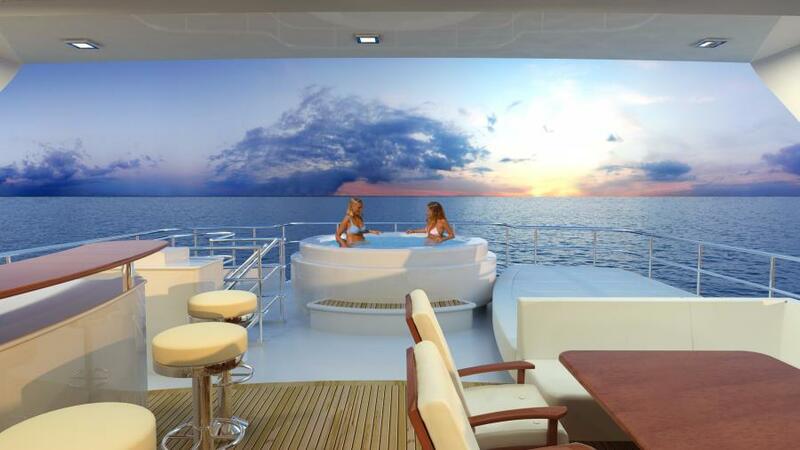 The All Ocean Yachts line was created with over 38 years of experience as a world cruising captain and broker driving it. 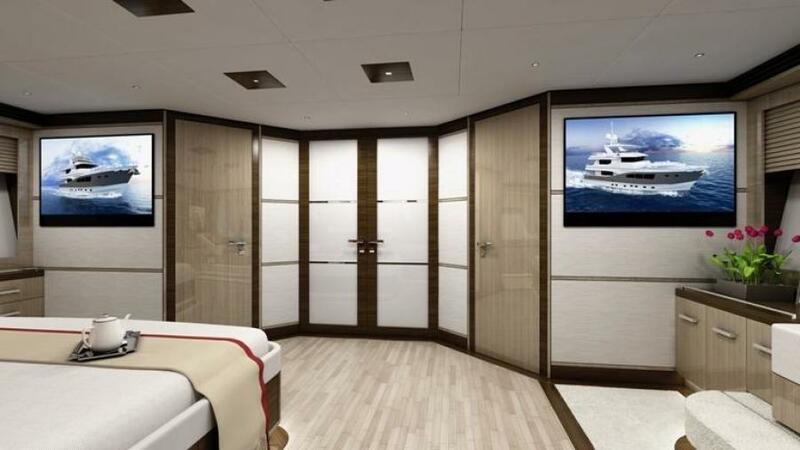 The design was evolved by putting it out for public comment to yacht professionals and yacht owner's for review during each step of development. 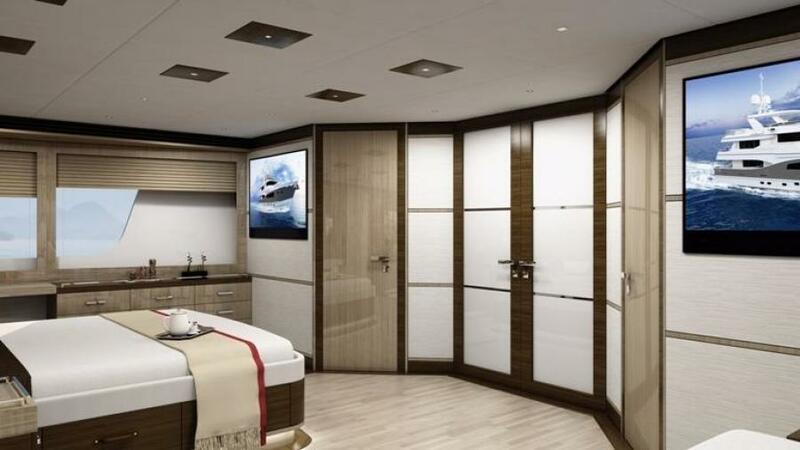 Taking into account their feed back we have created a very sophisticated design with extraordinary detail that meets all of the criteria a World Cruising Explorer Yacht should have incorporated in it. 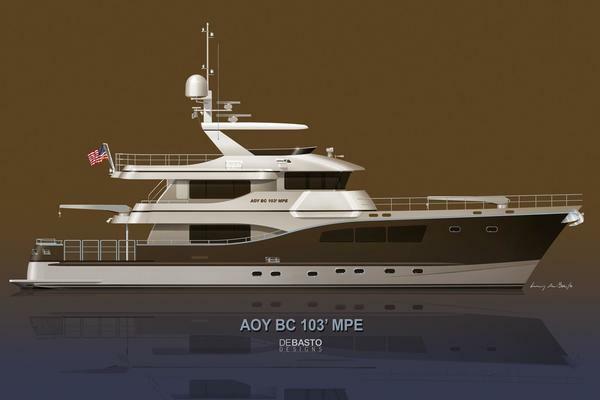 The mission profile of the All Ocean Yachts Explorer is to be a vessel capable of extended and remote world cruising in safety and comfort. To be able to visit exotic areas with little shore side support and have a minimum of operational up keep. 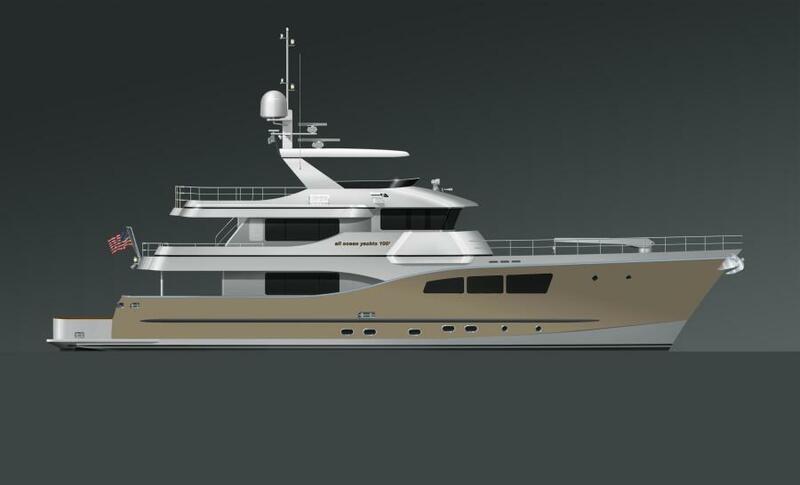 The diversity of layouts available means the All Ocean Yachts Explorer can be tailored to your requirements without creating a custom design. 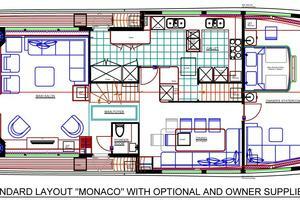 Her 3000 plus sq ft of indoor and outdoor living space provides expansive areas for comfortable living. 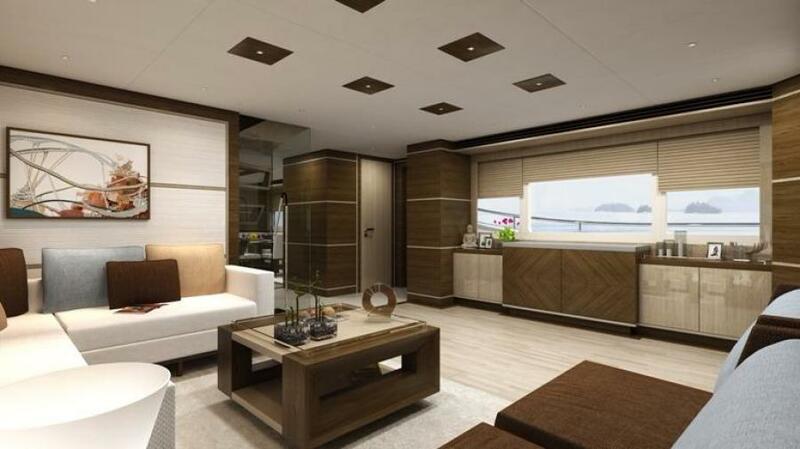 The guest and crew areas have a very high degree of separation and service areas that allow the crew to move about the boat providing top notch service while creating separate spaces for all. 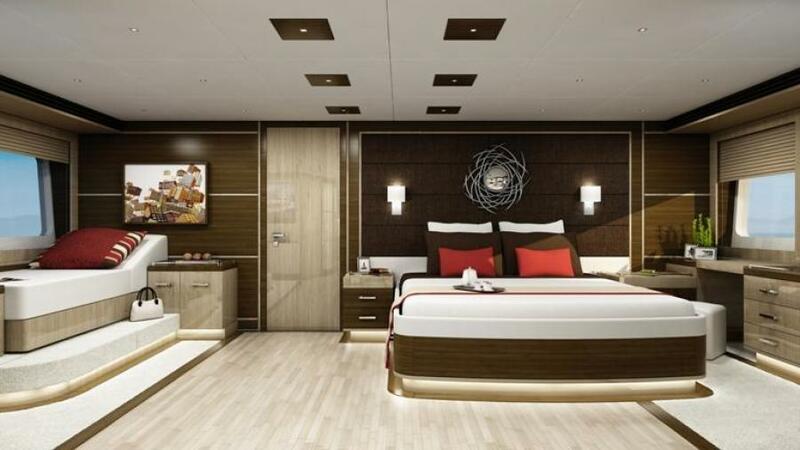 The All Ocean Explorer is ready to take you were ever you desire in safety and comfort. 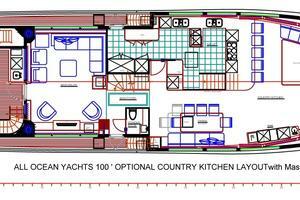 Another option is to have a full country kitchen with extra large additional pantry, informal dining/breakfast table. 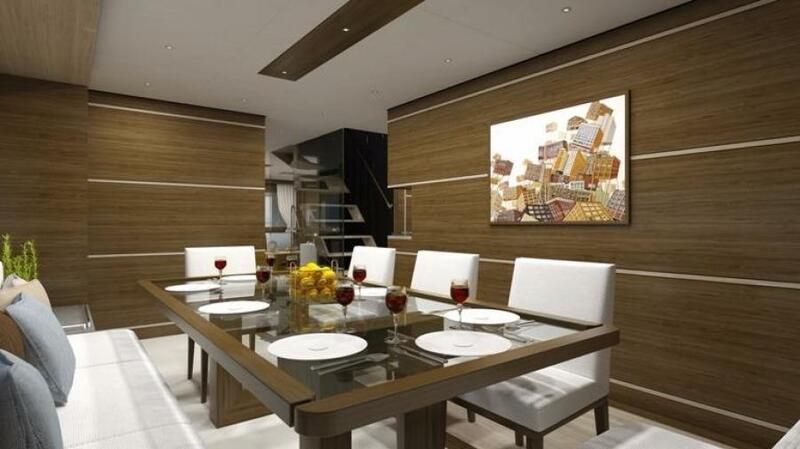 You still maintain the separate formal dining area; again you have a good office space. 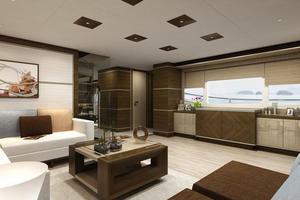 The main deck foyer separates the aft main saloon and the formal dining area. 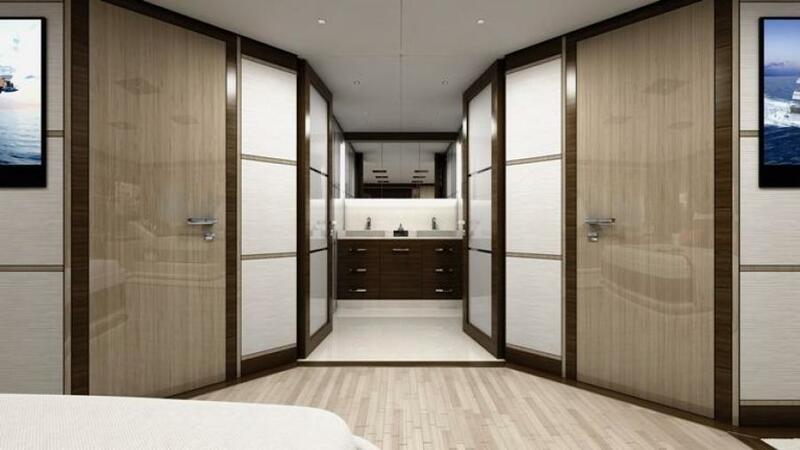 There is a door to the side deck, dayhead and wet locker. 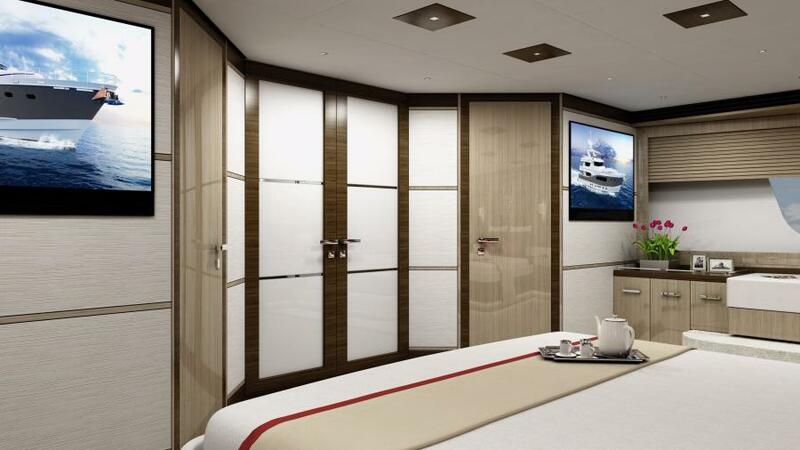 The bulkhead between the master stateroom and the galley and dining area is steel with sound insulation both for fire protection and privacy. There is an escape hatch from the master to the boat deck. 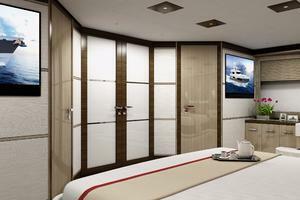 Aft of the master stateroom to Starboard is the separate dining room for 8 to 10 guests. 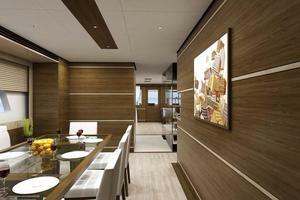 The dinning area has direct service from the large commercial style galley. The area has full advantage of the two large windows to create an open airy feel. 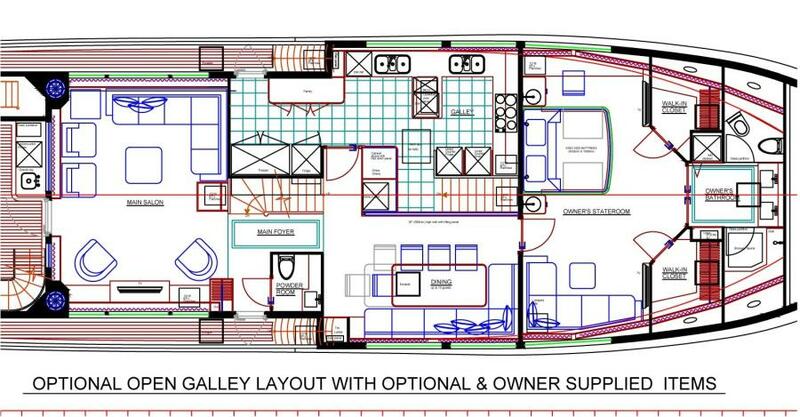 There is a large pantry in the stewardess area and a china cabinet/pantry located near the door to the galley and saloon. This cabinet holds the wine cooler and has dual doors allowing the china to be filled from the galley side and removed from the dining saloon side. 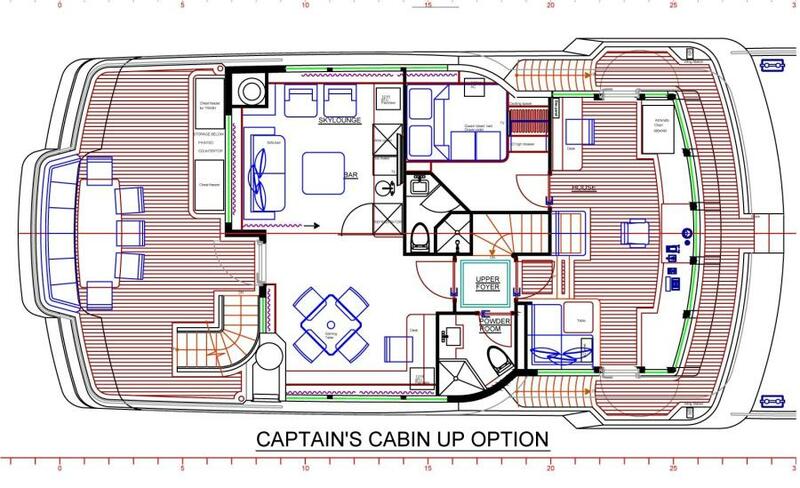 There is a door from the galley directly to the side deck. 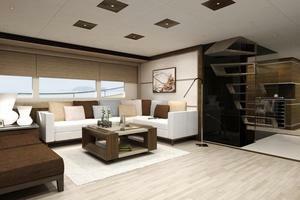 Aft of the main saloon is one of three out door dining and relaxing areas. 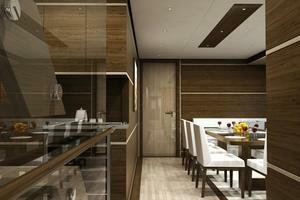 There is a table for 8 to 10 persons an wet bar with sink, refrigerator and trash bin. 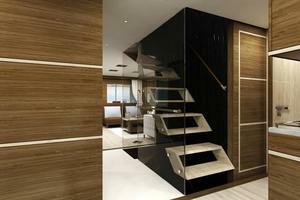 There are stairs leading down to the swim platform with access to the lazarette and engine room. 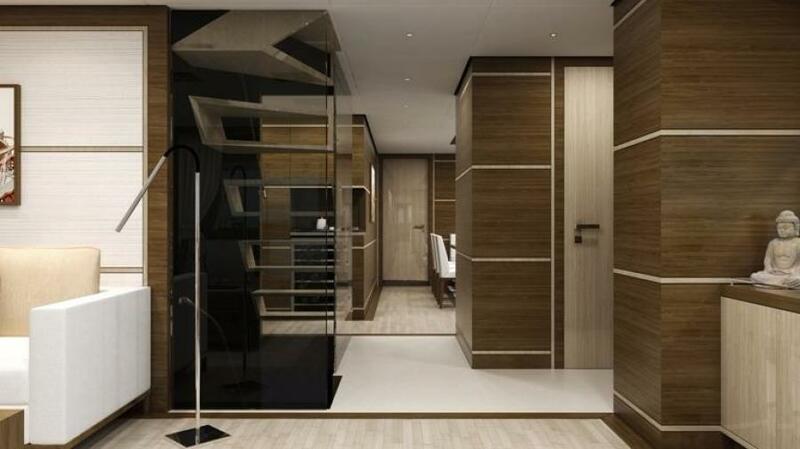 There is also a door directly from the aft deck to the engine room and stairs leading up to the aft bridge deck. 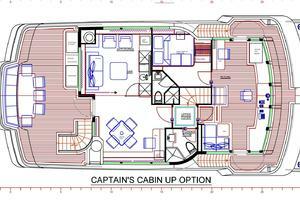 The two side walk ways lead forward to steps up to the pilothouse and boat deck. 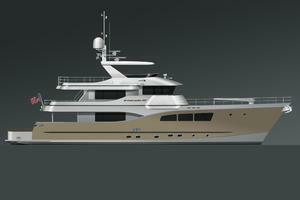 There are two cleats and a warping windless port and starboard on the aft corners of the deck. They are located on a raised shelf to easy working the lines. The raised position reduces the need to bend over when line handling and allows you to keep better visual contact with the dock and cleats enhancing safety and ease of operation. The cleats located on the lower main deck are also raised for the same reasons. 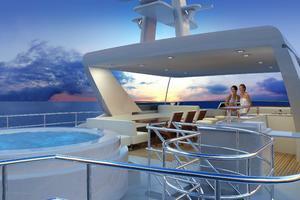 Aft of the skylounge is the second out door lounging and dining areas. 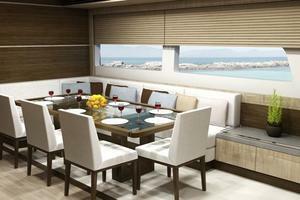 There is a table for 8 to 10 people, set out on a balcony offering a stunning view. The settee has been sized so that it is comfortable for both dinning and lounging / sun bathing. There is ample space for lounge chairs. Forward to port is a large cabinet that holds additional chest freezers, one is designated as a food freezer and the other as a trash freezer. 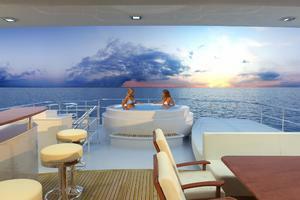 This is a point that is often missed on long distance cruising vessel. You can dispose of bio-degradable materials along the way but what do you do with other items that have been exposed to them. By using the trash compactor in the galley you can minimize the size of these materials and by freezing them you can keep them as long as necessary until you find a proper place to dispose of them. 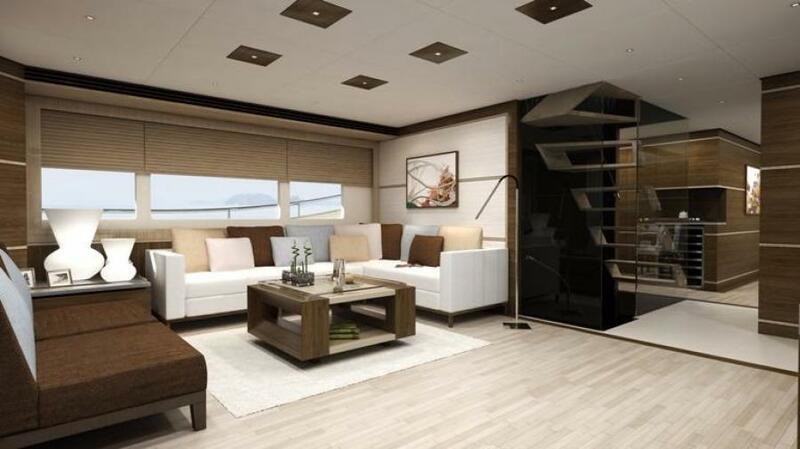 There is also space for storage of items needed for the deck. 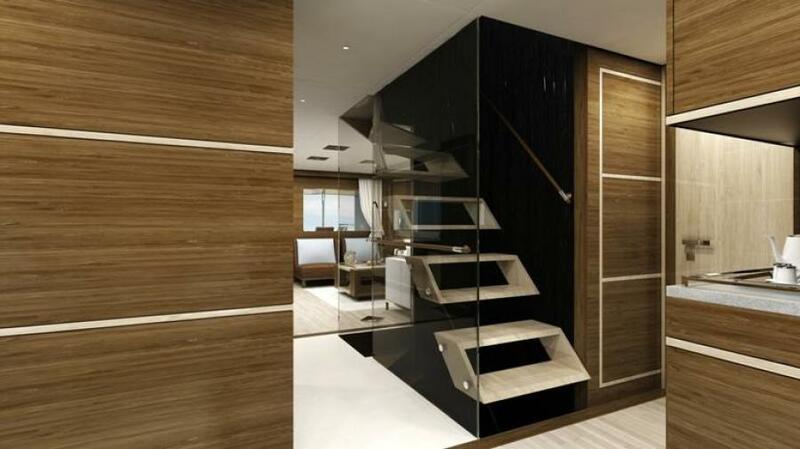 Up the stairs from the aft pilothouse deck you will come to an extravagantly large flybridge that has all of the space and features found only on much larger vessels and the 3rd of the outdoor dining and lounge zones. 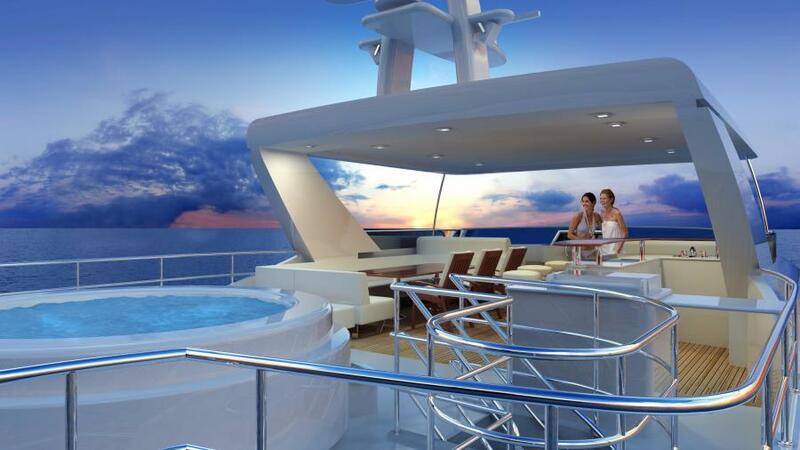 The Jacuzzi is aft and positioned to take advantage of the balcony, to next to it to port is an over sized raised sun pad which puts the people on the pad in a position to fully enjoy the views and communicate with people in the Jacuzzi. 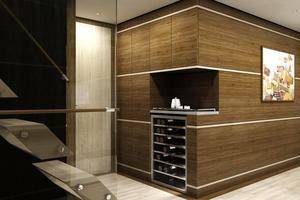 It also creates a huge storage area. 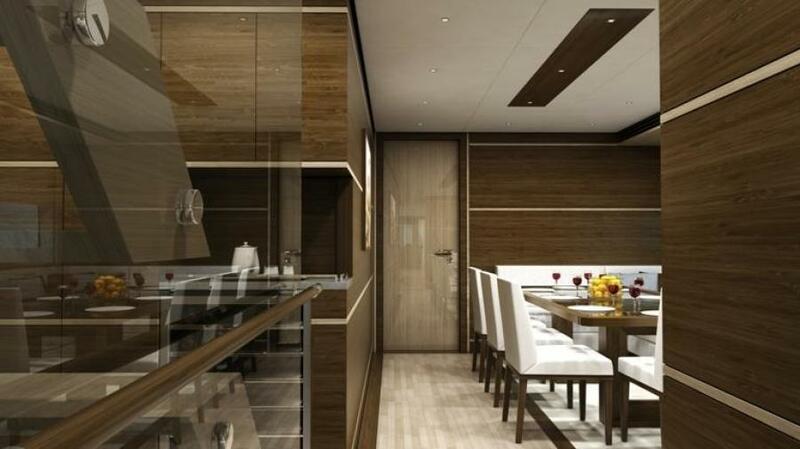 To starboard is the BBQ with cabinet and good working counter space on either side. Forward of this is the full bar with refrigerator another ice maker, sink and storage. 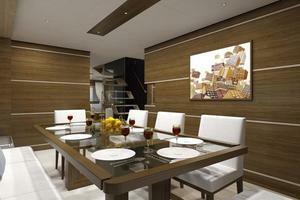 Across form the bar is the large dining table which can easily comfortably accommodate 10 to 12 guests. 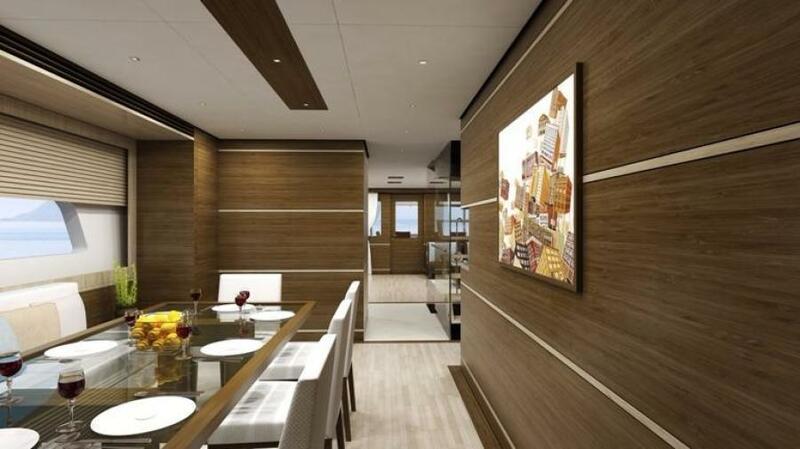 The open galley option takes the wall between the dining saloon and the galley and changes it either into a permanent open area with a railing along the crew access stair or with a half height wall that hides a sliding panel. 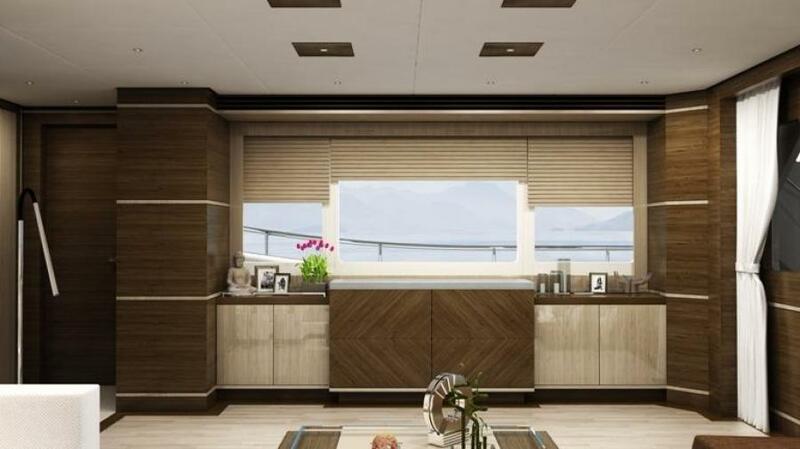 This is the preferred arrangement as it shuts the galley off when cleaning up or at other times when it maybe better to control odors within the galley. The full height fridge and stacked ovens are rearranged to be a under counter fridge and under counter ovens. 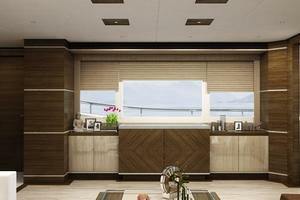 The china cabinet is stopped at counter height and there is a second cabinet above it which hides a fold down panel which fully closes off the galley. The country kitchen option creates 3 distinct dining options. 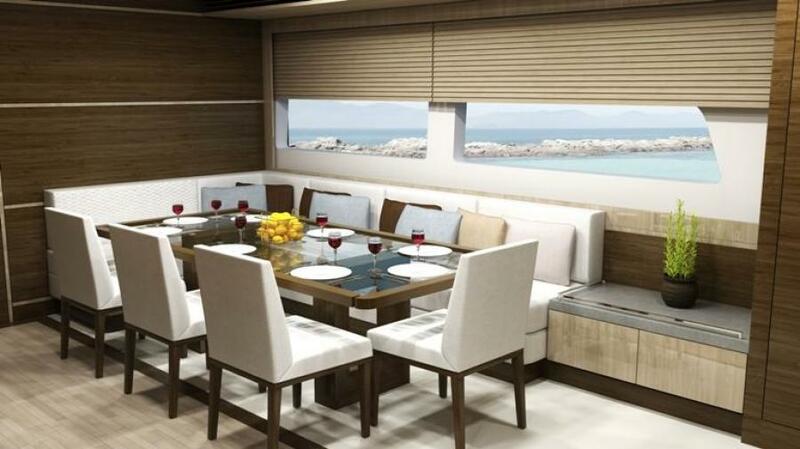 You have the standard formal dining table to starboard of the galley, a large informal dining table that can easily all of the guests and all the crew and a breakfast bar. 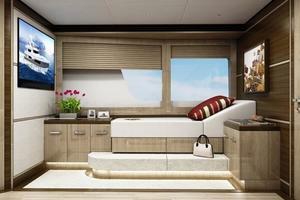 There is a full wet bar encompassing all the equipment that was located in the bar in the flybridge and a large desk / office area. 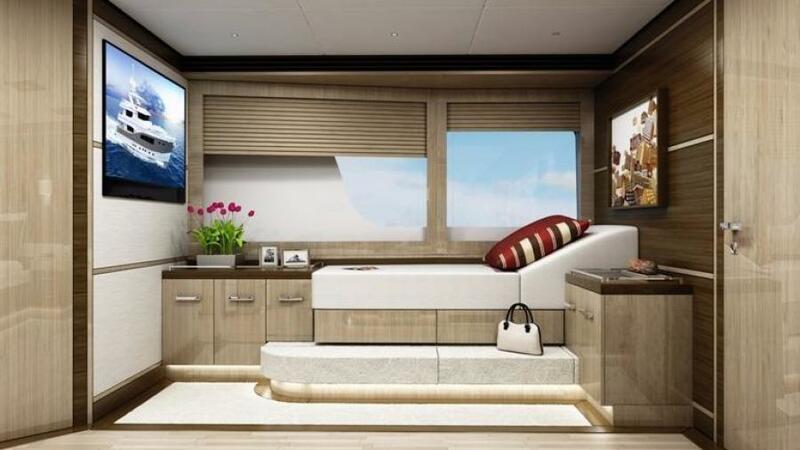 In addition there is a VERY large pantry forward which now holds the two freezers from the pilothouse deck and the full size refrigerator. The trade of is the galley loses one oven, but the micro wave is also a full size convection oven but we gain extra refrigeration space by adding a under counter fridge for the chef and still having the full size refrigerator in the pantry. 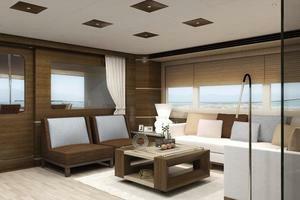 Bilge system: There shall be a AC power system and DC system, the AC system shall be backed up by the fire main system. 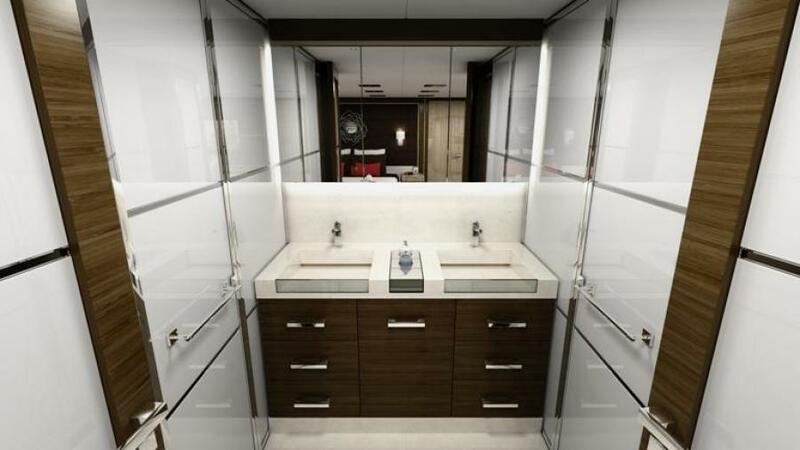 West Florida Yachts would love to guide you through a personal showing of this 100' Custom Tri-Deck Explorer Yacht 2021. 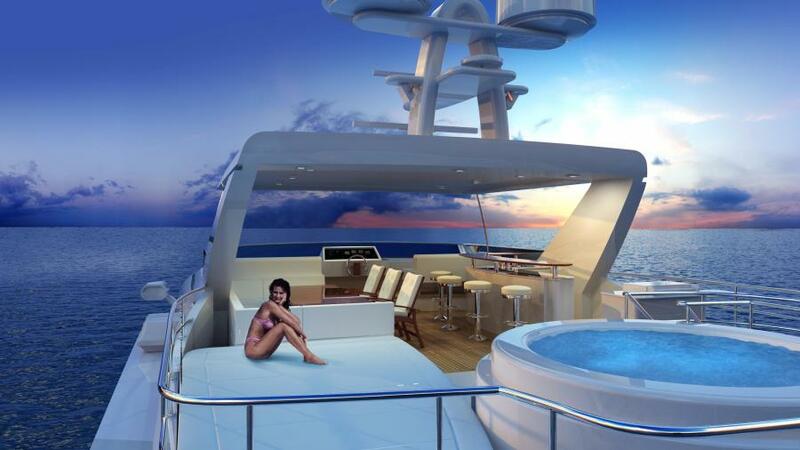 This yacht for sale is located in Unknown United States and priced at $8,950,000. For a showing please contact us by filling out the form on this page and we will get back to you shortly! The master up then gives you several other option for the main deck. 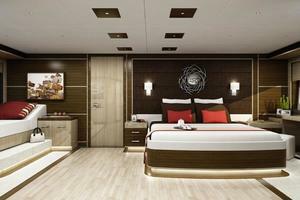 Forward on the main deck on the standard layout is the FULL BEAM MASTER STATEROOM. 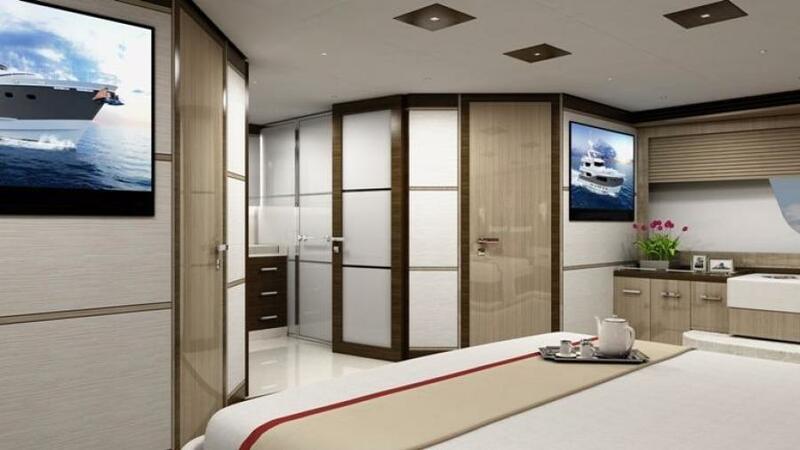 The master stateroom is lighted by two large windows bringing in abundant natural light which enhances the feeling of space created by the 24’2” beam. 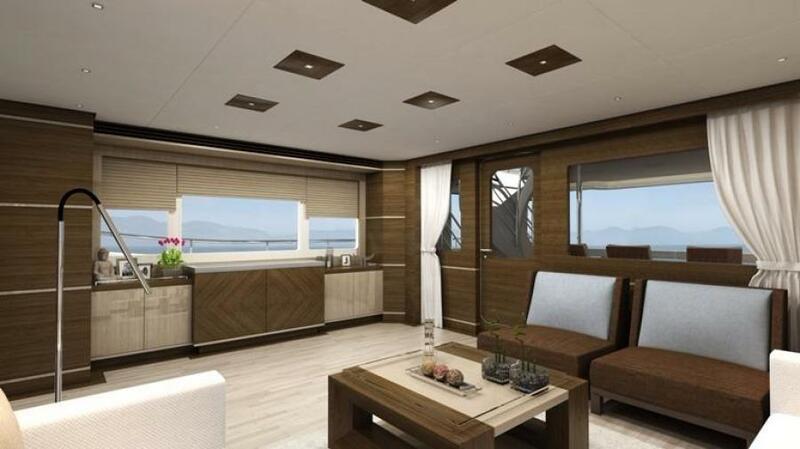 On entering to starboard is a 7’ L shaped settee with which is set against the windows creating the feeling that you are directly connected with the outside. 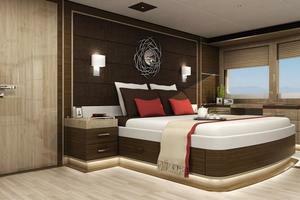 The King size bed is located just off centerline on the portside with built in pop up TV at the foot of the bed. 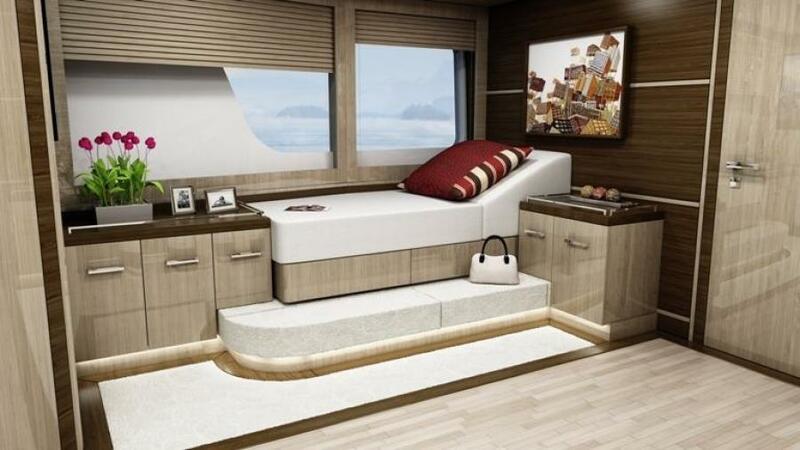 The position of the bed takes full advantage of the stunning view the port and starboard windows offer. 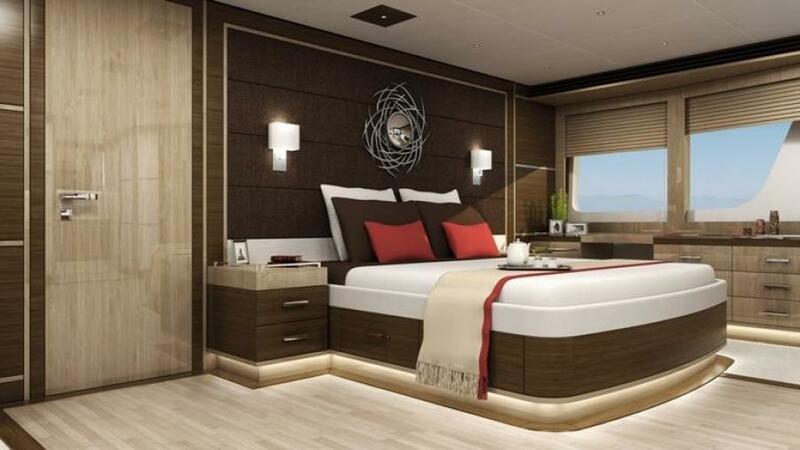 There are draws located under the bed and a large desk positioned in front of the portside windows. 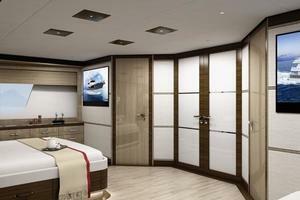 Forward of the bed to port and starboard are matching walk in closets with hanging area and draws. 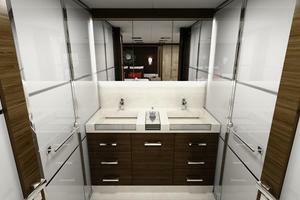 The large head is located centerline with his and her sinks, over sized shower, separate toilet room with bide. There is also a 3rd stacked washer dryer and linen closet. 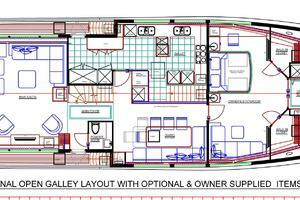 This option can be done with the standard close galley layout of the open galley layout. 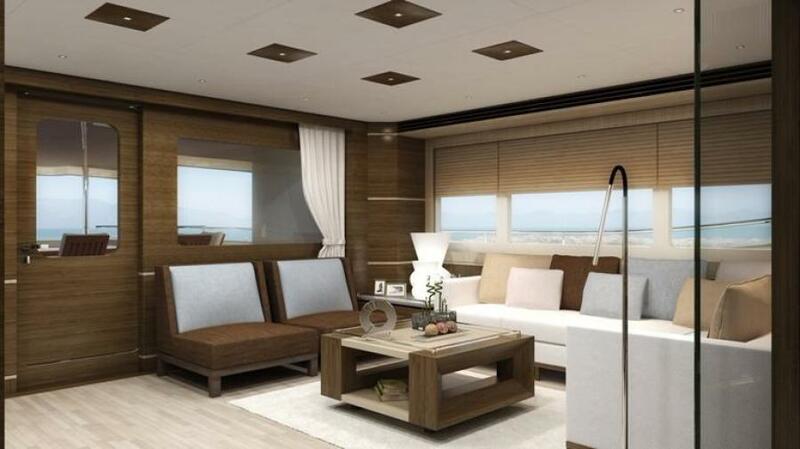 What is created with this layout is a very large TV and reading lounge. 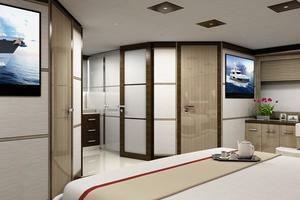 The lounge contains a large U shaped settee that has a pull out queen bed, forward there is a full head with shower, large closet. 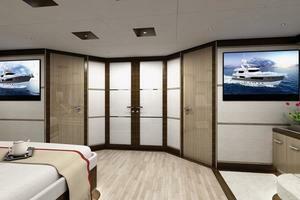 A 62” TV can be mounted on the forward bulkhead. 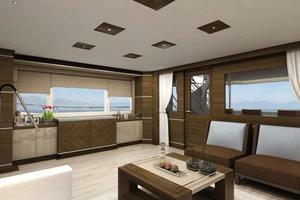 To starboard is a very large desk / office area and a raised settee set into the window to maximize the view. 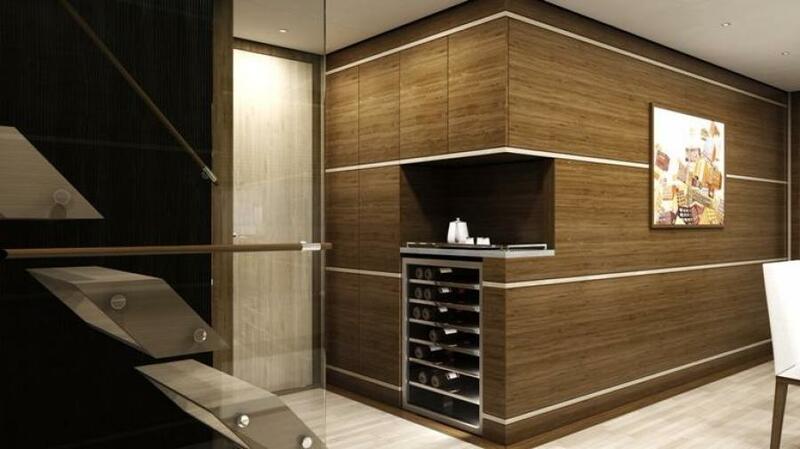 You can have a full wet bar to port or just a drinks refrigerator. 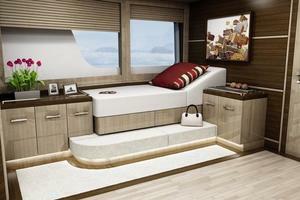 Aft you can keep the standard saloon arrangement or create the 3rd option. control. Stainless chain guard on bow, chain counters in wheel house. -Air horn: Buell quad pneumatic air horn with auto fog system. shall be backed up by the fire main system. -Fuel oil system: 4 tanks including day tank holding approximately 9160 US gallons (34,800 liters) Alfa Laval MiB 303 fuel cleaning system, two x Racor fuel filters, Mod 75-1000MA for main engines, 2 x Racor fuel filters, Mod 1000 single for generators, Blackmer series molel 414-414A electric transfer pump, one manual pump. -WINDSHIELD WIPERS Five (5) electric wipers, one for each of five (5) center windows, Exalto / Vetus 295M pantograph with integral washers, or equal, with stainless steel arms. -COMPASS Two (2) Danforth 5" Constellation or similar.